Serendipitously, (in the middle of a stressful week which I elevated the worst case of poison ivy into something even worse by getting another rash on top of it which was an allergic reaction to the allergic reaction I was having to the poison ivy!) I was handed an index card by the pharmacist along with my prescription for steroids (just in time for the AllStar HomeRun Derby) and told that I had better use it to organize my schedule for taking the drug. What a concept! And it all clicked — the old fashioned way continues to be a valid way to organize until we find an all inclusive system that handles both electronic and traditional– or till one medium triumphs and the other disappears so we only have one medium for data we need to keep. So for people still working on paper — keep that desk calendar! If you are all electronic and document searchable — you are ahead of the curve. Since I have had an electronic calendar that syncs with my desktop at work for at least 15 years, yet the historian in me still deals with paper artifacts and printed matter, I am analyzing what I need to keep track of and using the best system for that particular thing or project. 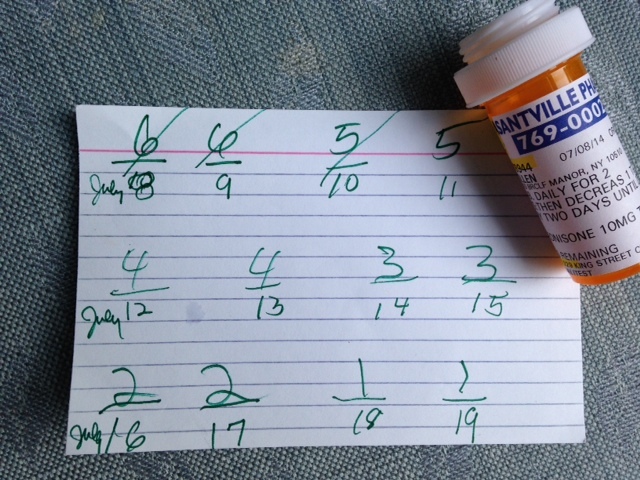 (For the medicine, since I was traveling, i used the IndexCard to keep in my wallet and I also kept track on my daily planner at home — but had I been 25 years younger, I am sure I could have managed one chart on my iPhone). I am a working hybrid with an eye toward improving my electronic organization one small step, one task at a time. July 17, 2014 in Need-to-know.